The Ny-1 gene confers hypersensitive response (HR) to Potato virus Y (PVY) in potato cultivars (Solanum tuberosum L.). Tetraploid potato breeding clone PB07–37 possessing the allele Ny-1 in a duplex state was developed. 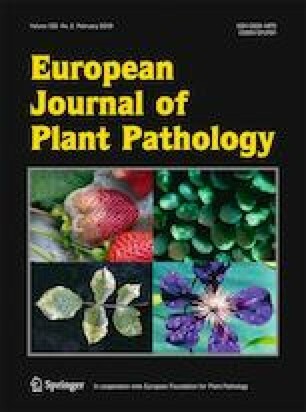 After PVY infection, the size of necrotic lesions in leaves of PB07–37 was reduced by approximately 68% in relation to cultivar Rywal plants displaying Ny-1 in a simplex dosage. Two-dimensional gel electrophoresis (2-DE) was applied for screening PVY-induced proteins in leaves of PB07–37. Compared with non-infected control plants, 60 reproducible PVY-induced proteins were detected using LC-MS/MS analysis, of which 41 were involved in qualitative changes and 19 were differently expressed in inoculated leaves by at least 1.5-fold. Proteins involved in the category of photosynthesis and primary metabolism were the most abundant. The results from PB07–37 (Ny-1 duplex) were compared with data from Rywal (Ny-1 simplex). The protein profiles in the Ny-1 simplex and Ny-1 duplex plants are genotype specific. Only eight proteins were identified in both genotypes. Five of them: ATP synthase CF1 alpha chain, chloroplastic; ATP synthase CF1 beta subunit, chloroplastic; ATP synthase subunit beta, mitochondrial-like; linoleate 13S-lipoxygenase 2–1, chloroplastic; and mitochondrial monodehydroascorbate reductase 5 are known to be involved in the defense response in plants. In our study, however, protein abundance did not correspond to the Ny-1 resistance gene dosage. The research was supported by The National Science Centre in Poland, grant UMO-2014/13/B/NZ9/02468.